Brecht, George et al. 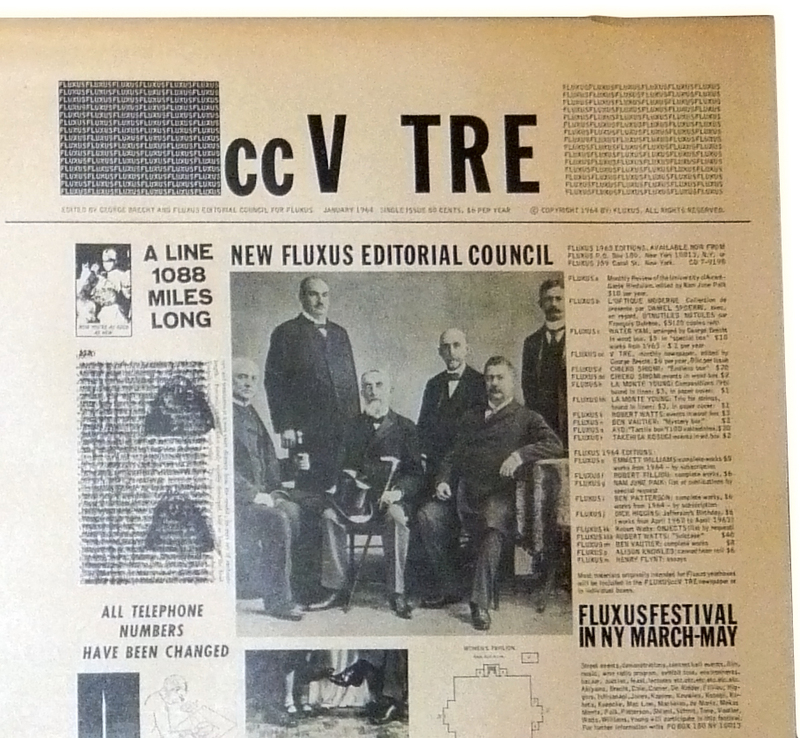 Fluxus No.1, January, 1964. New York: Valise Entrangle, 1964. Folio; illustrated in black and white; minimal chipping at the outer edges and a very small loss at one corner which does not affect any text or imagery. Near fine. First edition. 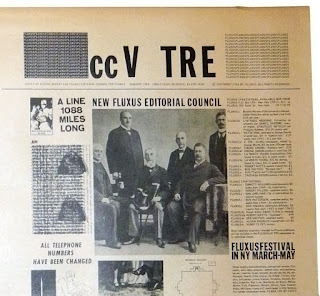 The first issue of the Fluxus Newspaper, aka V TRE, aka cc V TRE, aka… Brecht’s Fluxus periodical has as many variant titles as there were issues. Often known simply as V TRE, this first issue is called ccV TRE while later issues have the letters “V,” “T,” “R,” and “E” embedded in longer phrases, e.g. : “Fluxus Vacuum TRapEzoid,” “Fluxus Vaudeville TouRnamEnt,” “3 newspaper eVenTs for the pRicE of $1,” and “Fluxus Vaseline sTREet.” This publication was a group endeavor which includes work by several of Brecht’s fellow travelers in Fluxus but the editorial principle of the newspaper is Brecht’s notion that “experience in every dimension” could be expressed in printed text, or as “event scores.” An unfolded, unmailed copy; very scarce in this condition.